The monthly charts need very little in the way of annotation or commentary. 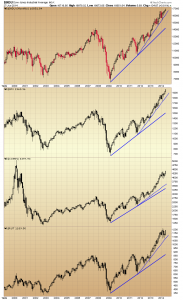 The major indices finished the second quarter near their highs and all indications are the long term trend is higher. 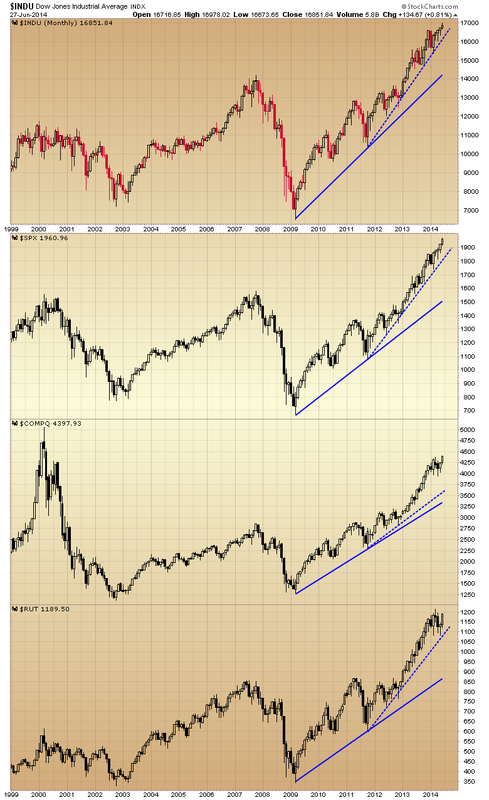 The weekly charts show consolidation in those indexes or pullbacks in the first half of the year, but all but the Russell 2000 have managed to make new highs. 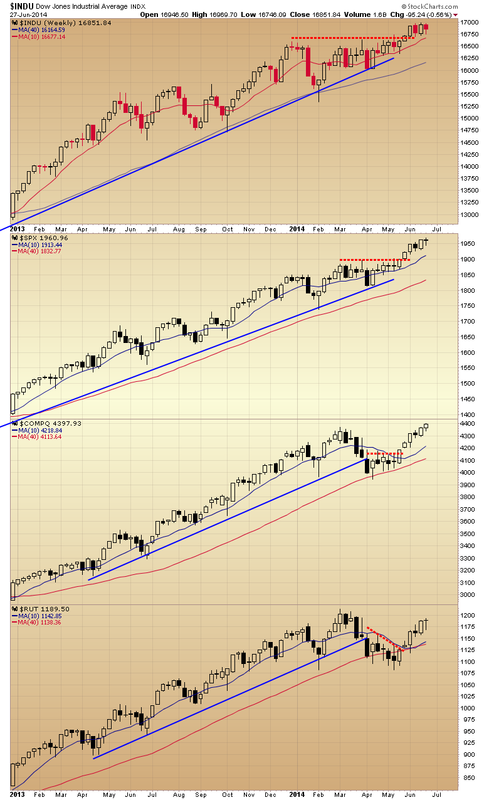 Here is how those weekly consolidations and pullbacks look like on the daily charts. 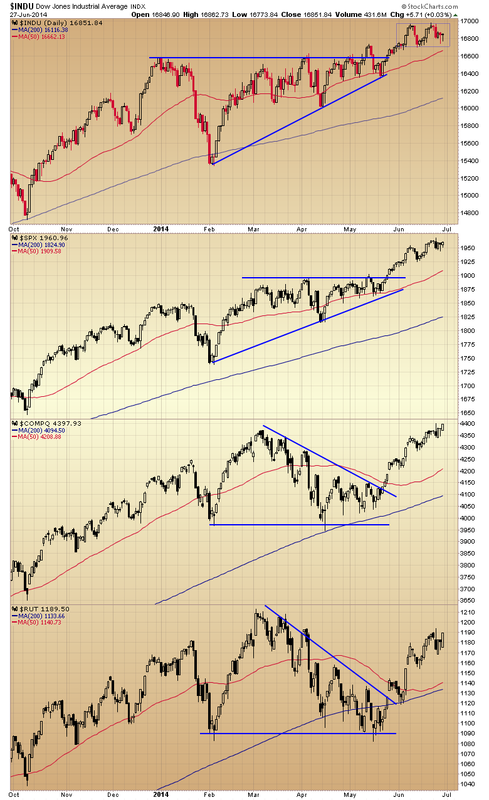 The DOW and the S&P 500 formed rising triangle patterns, which have been broken to the upside. 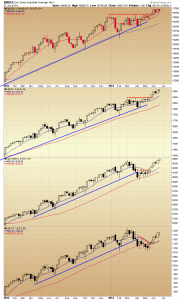 There is another smaller channel consolidation currently on the DOW chart, and the potential for a double top, but put in context, the index is more likely to take out resistance then break support. The RUT and the NAZ recovered from their January declines to make new highs in March, but then fell back to those earlier yearly lows. They broke their downtrend lines in May and have since made a series of higher lows and higher highs. 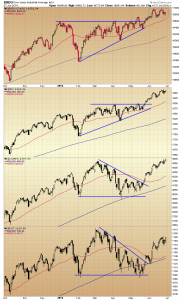 The trend on all three timeframes is higher, a rare case occurrence on any chart, and from a contrarian viewpoint, perhaps the only thing left the bears have to hang their hat on.